When I woke up this morning all I wanted to do was build a deck… err Well, maybe that’s not the first thing I thought of, but it ended up being about 4 hours of my day. After a nice morning at the church, we headed home for some bratwurst, hotdogs, and corn on the cob for lunch. As soon as the meal was over I joined my father-in-law at his house to help build his deck. I’m pretty sure that most people use DIY deck building because building your own deck saves a lot of money as compared to hiring it our. The deck we’ve been building is framed on ten 4×4 supports, evenly spaced. The corner posts and center posts extend vertically because when finished, the deck will feature a roof. The posts are cemented into 24″ deep holes. The framing was fully done with 2×6’s around the perimeter, and then crossing every 5′. The 2×6’s are lag bolted into the 4×4 supports. Then cross members were put in using 2x4s with 3 1/2″ screws. Most of the above was already done as of today. Our DIY deck building today was attaching the actual deck boards to the surface of the framing. 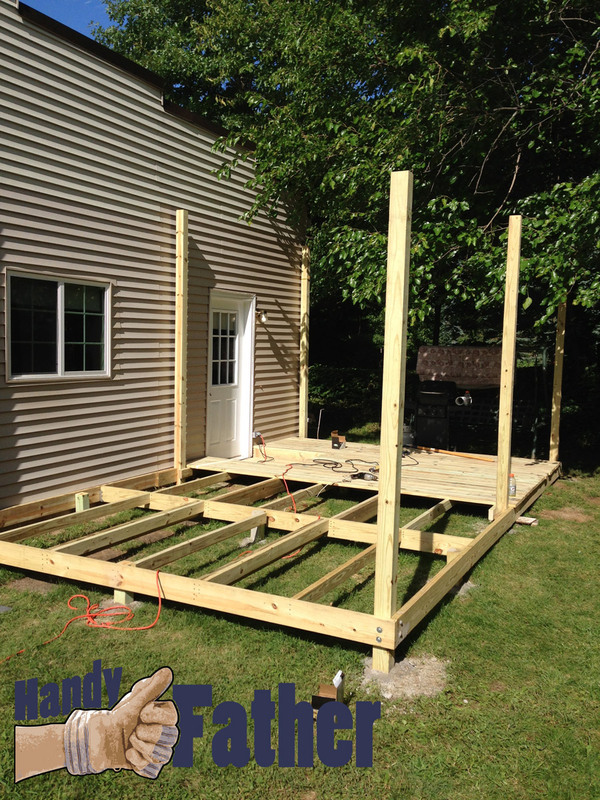 We used 3/16″ spacers on the ends of the deck boards and got about half of the decking installed. The deck boards used are standard deck boards. They are 5/8″ thick and 12′ long pretreated wood. I spent about 4 hours doing most of the pre-drilling and screwing of the deck boards. We pre-drilled the ends of the boards to prevent splitting. The pre-treated wood has a high moisture content and doesn’t split easily, but you can’t be too careful. Not only is DIY deck building a rewarding process because of the money saving benefits, but it is also a pretty good workout. Drilling, Screwing, and squatting down all day makes a nice deck, and I’m sure to be sore tomorrow! Not a traditional workout day, but I did also complete the ab challenge day 2 as well as 3 pul-ups (wow I know).